Coverage: Ham. See Comments Readout:	Analog Lin. Circuit Complement: 6DC6 RF Amp, 6BA6 1st Mixer, 12AT7 Crystal Osc, 6DC6 1st IF Amp, 6BA6 2nd Mixer, 6CB6 VFO, 6DC6 2nd IF Amp, 6BA6 3rd Mixer, 12AT7 SSB Switch Osc., 6DC6 3rd IF Amp, 6BY6 Product Detector, 6BJ7 AM Detector/2nd AVC Rectifier/ANL, 12AX7 BFO/1st Audio Amp, 6AQ5 Audio Out, 6AU6 Crystal Calibrator, 6AU6 S-Meter, 6AU6 1st Loop AVC Amp, 0A2 Voltage Regulator and 5 silicon diodes. Comments: Ranges: 3.5-4, 7-7.5, 14-14.5, 21-21.5, 28-28.5, 28.5-29, 29-29.5, 29.5-30 and 9.6-10 MHz. (9.6-10 MHz not calibrated). 1 kHz dial accuracy between calibration points. Gear driven tuning with virtually no backlash. Requires a speaker. Matches the HT-33 and HT-32 transmitters. Designed to compete with the Collins 75A/S series. Coverage:	Ham. See Comments Readout:	Analog Lin. 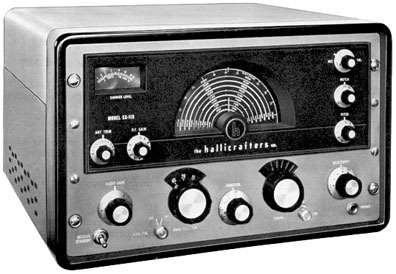 Modes:	AM/CW/SSB Selectivity: 5/2.5/.5 kHz -6 dB. Circuit Complement: 6DC6 RF Amp, 6EA8 1st Mixer/Cathode Follow, 12AT7 Crystal Osc, 6BA6 1st IF Amp, 6BE6 2nd Mixer, 6EA8 VFO/Cathode Follow, 6DC6 2nd IF Amp, 6EA8 3rd Mixer/SSB Switch Crystal Osc, 6BA6 3rd IF Amp, 6BE6 Product Detector/BFO, 6BN8 AM Detector/AVC Amp/AVC Rectifier, 6GW8 1st Audio Amp/Audio Out, 6AU6 Crystal Calibrator and four silicon diodes. Comments: Ranges: 3.5-4, 7-7.5, 14-14.5, 21-21.5 and 28.5-29 MHz. Optional crystal positions for: 9.5-10, 28-28.5, 29-29.5 and 29.5-30 MHz. Product detector for CW/SSB. Requires a speaker. 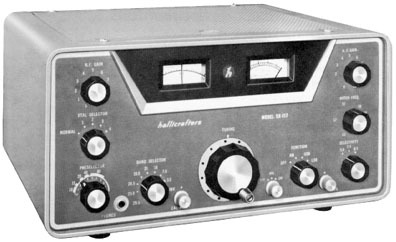 Matches the HT-44 Transmitter. Click here to view more photos and more information or click here to view sold archive at Universal Radio. ©1999-2009 by Universal Radio Research. All rights reserved.